Mist.io supports bare-metal servers. 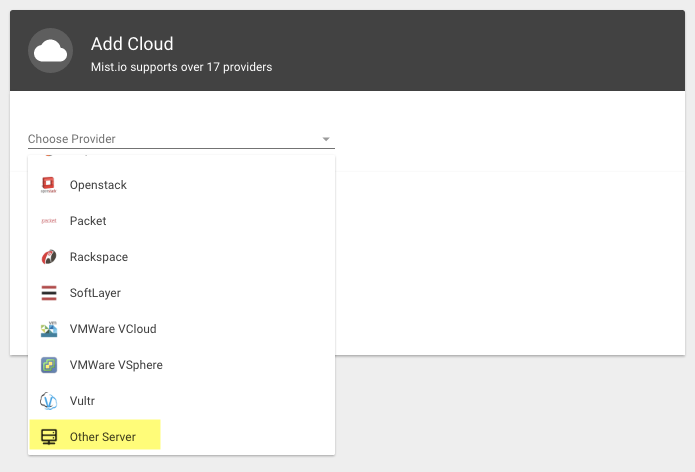 This means you can use Mist.io to manage bare-metal servers that reside in your private data center or with a service provider. Complete the Add Cloud form. You will need to input a Title, HostName, operating system, and SSH Key. If you add an SSH Key to the server, you can use Mist.io monitoring and alerting, scripting, Ansible, and orchestration features. Also, if the bare-metal server resides on a private network, a virtual private network will need to be setup to access the server. Mist.io provides a VPN service based on OpenVPN; learn more here: Tunnel. When the server has been added to Mist.io, it will appear in the Machine page, alongside your other public and private infrastructure. The benefit to using Mist.io to manage your bare-metal infrastructure is that you now can see and manage your public cloud and your bare-metal servers from one console. You can manually set prices for your bare-metal servers so that they appear in the cost reporting widget. Now you can see your public cloud costs right next to your private or dedicated server costs, providing you a single view of all your hybrid cloud infrastructure costs. Adding Clouds, Bare-Metal, and Containers.